Shop our round convex mirrors available in top brands such as Klear-Vu, Econo-Lite, Duramir, and Se-Kure which allow you to see all activity around blind corners, aisles, hallways, gondolas, and obscure areas. Circular convex mirrors provide a 160 degree view, cover more area and reflect more detail than any other security mirror. We offer diameters starting at 5" all the way up to 48" to fit virtually every need. All round convex mirrors are easy to install and come supplied with a swivel arm assembly and mounting brackets. Choose from acrylic, glass, or unbreakable lens in indoor and outdoor versions. Small convex mirrors (5" - 12") will perform best in confined areas such as cubicles, restaurants, schools and small shops. 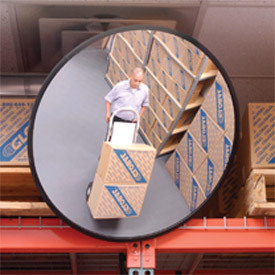 A Round convex mirror is the most common safety and security mirror utilized today for blind spot coverage in retail stores, warehouses, offices, outdoor areas and just about anywhere you can imagine. They enhance and compliment surveillance systems, loss prevention and safety programs, as well as routine security around the home. Regardless of the size/diameter, they provide a 160° view and will cover more area than any other mirror type. Convenience and retail store owners know the value of a circular convex mirror. They allow for increased vision down aisles, gondolas, around beverage coolers, shopping areas as well as parking lots and gas pumps. They are one of the most effective and least expensive theft deterrents. Shop lifters will think twice before making a bad decision when they spot a security mirror. 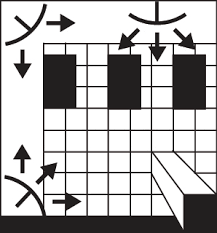 Industrial facilities use them to monitor production areas, plant floors, and high accident areas. Warehouses use them to prevent forklift traffic and pedestrian accidents. All of our round convex mirrors are Made in the USA with all materials sourced from within the USA. We only sell the top brands from manufacturers who have been manufacturing top quality safety & security mirrors for no less than 60 years. Mirrored lens are available in glass, unbreakable or acrylic in diameters from 5" up to 48". Indoor and outdoor mirrors are available in a variety of different backing types for different applications. All models are equipped with adjustable swivel arm and mounting hardware. Installation is quick and easy with easy to follow step by step instructions. Installation is simple and does not require you to hire a contractor or handyman. Shop National Safety Mirror for quality, value and friendly free advice. We can help you find the right mirror for your application. Simply give us a call - we're here to help. If you happen to find a better price let us know. We will do our best to meet or beat competitor pricing.